Shipbuilding Completion Oy is a company specialising in turnkey deliveries of public facilities for cruise ships and liners. Its parent company, Meyer Turku Oy, is a leading European builder of cruise ships and liners. The company, located at the Turku shipyard, employs more than 50 professionals. Leijona workwear, a new business partner, has now successfully supplied the company with workwear for a year, and the satisfied customer believes that deliveries will be extended to its subcontractors as well. Shipbuilding Completion Oy, an independent subsidiary of Meyer Turku Oy, operates as a provider of turnkey shipbuilding projects at the Turku shipyard of its parent. The company focuses on the public facilities of a ship – restaurants, bars, shops, etc. Iiro Haapanen, Project Manager at Shipbuilding Completion Oy, is satisfied with the current supplier of workwear. He has experience from 34 years at various shipyards and shipbuilding companies. 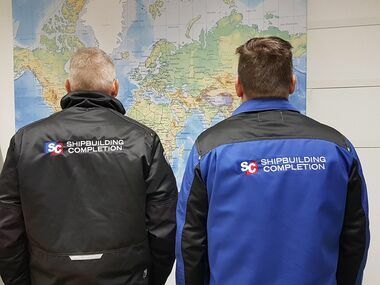 The company has an important role in the world leading shipbuilding group: “We do all the planning and background work from insulation, ventilation, piping and wiring to the entire interior down to the last skirting and fitting. At present, we are working with three vessels at various stages of production, covering a total of 29,000 square meters; the vessels are to be delivered to three different customers (TUI, Costa and CCL)”, Mr Haapanen says. Shipbuilding Completion Oy has purchased Leijona workwear for its people working as forepersons, storage workers, co-ordinators and project managers. The unlined jackets in the Leijona FleX range, the winter jackets and the FleX Stretch pants have performed well on the job, the feedback from the users has been positive, and the quality-price ratio is on the point. It is great that there are fits for women as well. The customer is satisfied with the total offering of Leijona workwear, the handling of orders, the prints, the delivery times and the reliability of deliveries. We haven’t had any suggestions or wishes regarding the collection or the supply of workwear. “Everything has been just right!”, Mr Haapanen says. Shipbuilding Completion Oy engages in a lot of cooperation with a variety of companies and subcontractors. All installation work is subcontracted. There can be tens of suppliers working on a new ship, from plumbers to finish painters and everything in between. Part of the suppliers are Finnish, but a major part are foreign, generally from the Baltic Countries. The marine and shipbuilding industry is usually regarded as a specialist industry. 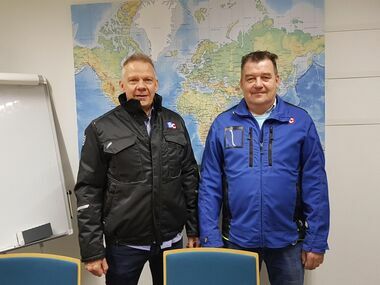 We ask Mr Haapanen if he thinks that Leijona workwear is suitable for the operations/personnel of the business partners of the company, and whether Leijona could assist in their workwear solutions and procurement as well. “It really is a very broad industry; beside welders and sheet metal workers it requires a lot of different professions.We would love to suggest solutions that work for your subcontractors, we would like to take good care of them as well,” Mr Haapanen says. Finally: How do you propose that this co-operation should continue? “Same old, same old, that’s the best way”.